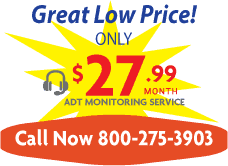 The ADT Money Back Guarantee gives your peace of mind by knowing that ADT stands behind their name and their service. Money Back Guarantee states that ADT will refund the installation costs and all monitoring fees if you are not satisfied with the service within six months. Please refer to the certificate for all the details.